The Federal Reserve’s increased aggression over the past couple of years has finally come home to roost. The yield on the 10-year Treasury recently rocketed above 2.8% – a four-year high – while the 30-year cleared the 3% mark. That’s bad news for investors in many traditional dividend-paying blue chips. The 10-year T-note might as well have been a “high-yield” savings account the past few years, offering almost laughable income of less than 1.4% as recently as 2016. That kind of environment gives investors “yield goggles,” making even no-growth stocks look attractive as long as they’re paying out near 3%. 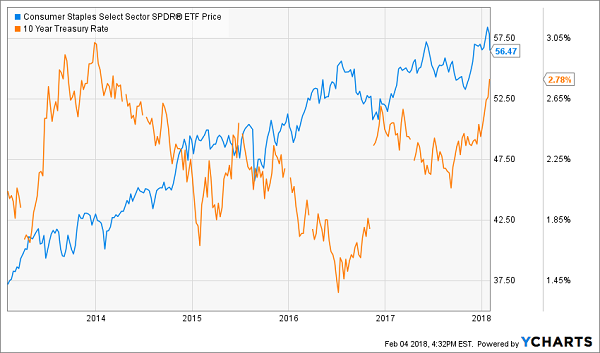 Just look at the performance of the Consumer Staples Select Sector SPDR (XLP) – a collection of companies such as Procter & Gamble (PG) and Coca-Cola (KO) – against the 10-year Treasury rate. While the XLP has broadly grown, it’s strongest when the T-note’s yield is in decline, and the fund typically stagnates or declines when the Treasury begins to deliver more income. But Treasury yields, which have been in recovery mode since mid-2016, have really caught fire of late. That’s because economic and wage growth have started to crank up, sparking worries about the potential for inflation – and the potential for the Fed to get more hawkish and hike the Fed funds rate more often, more quickly and more steeply than already anticipated. If so, owners of sleepy, merely decent-yielding blue chips should be on watch. That’s not only because Treasuries suddenly look more attractive by comparison, but also because higher rates may renew strength in the U.S. dollar. That in turn would weigh on profits garnered by the international arms of several ho-hum multinational companies, and further pressure their stocks. So if you own any of these widely held blue chips, you’ve been warned. It’s time to step into something with more potential. I want to start out with one of my favorite whipping boys – Coca-Cola (KO). Those arguments explain how Coca-Cola might be around forever as a company, but they sure don’t help me understand how anyone’s supposed to make any money off KO shares. It’s one thing to survive. But we need our investments to thrive. Soda is under attack not just here in the U.S., but across the world, as sugar is slowly but surely seeing the same kind of narrative transformation that tobacco underwent many decades ago. France, Mexico and South Africa are among countries that already tax sodas and other sugary drinks, and more nations are beginning to follow suit. Major cities across America are starting to either enact or are discussing similar levies. Coca-Cola is fighting back. In addition to growing their offerings, they’ve already retooled Coke Zero and revamped Diet Coke with a redesign and additional flavors. But the trend is not Coke’s friend. Soda sales in the U.S. (for all companies) have declined for 12 consecutive years. KO’s unit case volume in the third quarter was celebrated for merely being flat. The company’s revenues are expected to finish 2017 down 16%, and analysts see another 12% decline coming this year. Coca-Cola keeps hiking prices on its wares, so its profits are at least stable, but this is not a path to prosperity. It’s certainly no reason to settle for a 3% yield that’s not as secure as U.S. debt. You’d think any company peddling liquid happiness in an increasingly stressful and combative world would be a stock-market gem. And you’d also think things would be looking bright for Anheuser-Busch InBev (BUD) given the wild popularity of their new “Dilly Dilly” ad campaign. Meanwhile, Budweiser has been trying to buy up well-known craft brands – such as Kona, Devils Backbone and Goose Island – to make up for growing weakness in its core Budweiser products as drinkers eschew those boring brands for a wealth of small-batch offerings. Problem is, Americans don’t drink beer like they used to. And the shift away from brews looks permanent for now, with Millennials preferring the taste of spirits and Tide Pods. 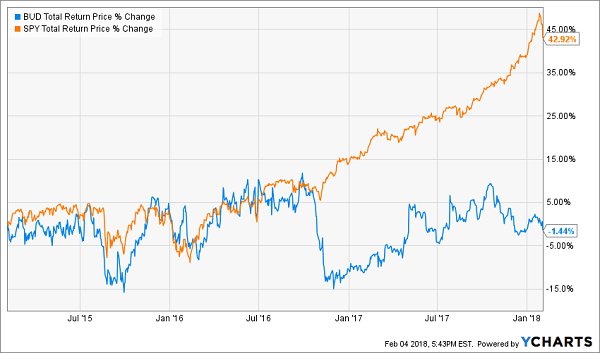 BUD shares, including a good-but-not-great dividend, have delivered a slight loss over the past three years versus a 43% total return for the S&P 500. 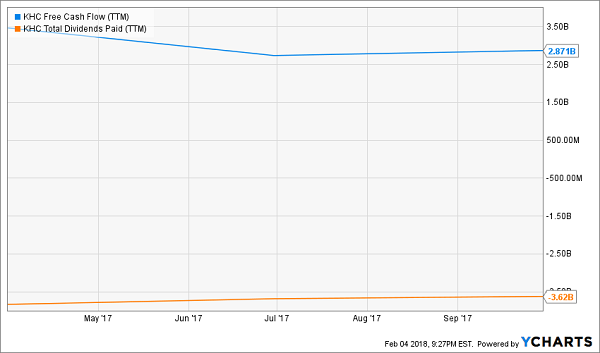 A nearly 3% T-note doesn’t exactly look great, but it sounds much better than investing in the continued deterioration of the Budweiser brand. Even when things go well for General Mills (GIS), they don’t go that well. The parent of Cheerios cereal, Yoplait yogurts and Green Giant frozen produce has been dealing with shrinking revenues and stagnant income for years. Thus, its 2% top-line growth in its fiscal second quarter – fueled by 7% improvement in its cereal business – should’ve been cause reported back in December, should’ve been cause for celebration. For a short time, it was. But investors may be starting to settle into reality, which included a couple other revelations from that same report. Namely, that growth came at a cost, with gross margins dropping 2.6 percentage points to 34.4%, and the fact that even with an upgraded outlook, GIS at best sees 2018 organic sales growth to be flat. General Mills has its positive points. The company has paid out dividends for more than a century without interruption, and it has improved its annual payout for 14 consecutive years. But it’s doing so at a snail’s pace, with the last increase a token 2% uptick. And the company’s increasing difficulties selling its breakfast wares has held the stock back for years; the market has nearly tripled GIS’ 31% gains over the past five years. Investors seeking growth have long had better options at their disposal. Now, bonds are starting to encroach on General Mills’ role as a place to get stable, modest income. Kraft-Heinz (KHC) – whose portfolio of brands includes Velveeta, Jell-O, Kool-Aid and Oscar Mayer – isn’t necessarily suffering a breakfast problem like General Mills, but it is coming up against a headwind that’s biting many producers of packaged foods: trends toward both healthier eating when people are cooking at home, as well as increasingly frequenting restaurants. That doesn’t exactly leave much room for shells and cheese. Kraft is plenty profitable, but it’s mostly achieving that through cost cuts – not sales growth. For instance, in its most recent quarter, profits of 83 cents per share beat expectations by a penny, but that came on a 1% dip in adjusted net sales to $6.27 billion. And while the company is operationally sound, I don’t like the lengths it’s going to pay out its dividend. Over the past year, KHC has paid out 126% of its free cash flow to investors. One other theme I’ve recently explored that spells trouble for Kraft: The rise of Amazon’s (AMZN) grocery business and its partnership with Whole Foods. The pairing is making fresh foods more affordable to more Americans, helping them ditch the Lunchables for healthier fare. It might have made sense at one point to sit in Kraft and collect a 3% dividend in perpetuity while the stock puts up low-single-digit gains. But with growth fleeting and longer-term Treasuries cracking the 3% line, this consumer staples name has little appeal. No one is suggesting to go out and sell Wells Fargo (WFC) and put all those profits into bonds. Tax reform, the eventual stripping-down of financial regulations and higher interest rates are going to be a boon for just about every financial institution, from national money-center banks all the way down to credit unions. But Wells Fargo, which has been dealing with the fallout of its own widespread fraud – has just been placed at the back of the pack. WFC once was considered among the safest of the “Big Four” financial institutions because it didn’t present the same trading risks as Bank of America (BAC), Citigroup (C) and JPMorgan (JPM), and in general had a fairly sterling reputation. The national spotlight burned into Wells Fargo over the past couple of years, however, after it was revealed that it had opened up to 2.1 million potentially fraudulent accounts (later revised up to 3.5 million accounts) between January 2009 and September 2016. The scandal cost Wells Fargo its reputation, hundreds of millions of dollars in fines and then-CEO John Stumpf’s job. But the latest penalty is perhaps the most damning. The Federal Reserve recently slapped the cuffs on Wells Fargo, announcing, “Until the firm makes sufficient improvements, it will be restricted from growing any larger than its total asset size as of the end of 2017” – a first-of-its-kind punishment from the Fed. While the company still can make loans and operate most of its businesses, Wells Fargo effectively has been shackled with a speed governor at a time when all banks are primed for liftoff. Throw in worries about a bursting bond bubble weighing down stocks, and the fact that WFC’s yield is actually significantly below the 10-year, and you have ample reason to dump this stock and head for cleaner waters. You’re not going to get to the retirement finish line in tact by investing your hard-earned money in lousy staples plays and banks of ill repute that yield just 3% each year. Don’t believe me? Do the math. If you earn 3% on a portfolio of $500,000, you’re bringing in just $15,000 each year in investment income. Even if you tack on a couple extra percentage points in stock gains to these sleepy blue chips, those are returns you’ll have to withdraw every year, keeping your nest egg stagnant and capping your income potential. Kraft, General Mills, Coke – they’re not going to get you anywhere near what you need if you want to reach retirement fully funded so you can sit back and relax and comfort. 12% in safe, annual returns. It’s not easy to reach 12% between dividends and capital gains. Many double-digit yielders have unstable payouts that could disappear within years, while it’s impossible to know when the growth train will stop for dividend-less momentum plays. However, I’ve compiled a set of stock picks that offer the high current yield, dividend growth and capital gains necessary to generate at least 12% in annual returns – which is what you need to ensure the kind of no-worries retirement you’ve been working so hard to achieve for so many years. This portfolio is retirement rocket fuel, because it provides the best aspects of numerous types of investment strategies – income, growth and even nest egg protection! This basket of seven conservative investments includes under-the-radar stocks that can return 12% annually, which is enough to double your portfolio in six years. It also is built to be more durable against market downturns like 2008-09, which ruined retirement for countless Americans. And best of all: It provides three times more income than most retirement experts say you need! The real-life benefits are plain as day. This retirement portfolio will allow you to pay your bills from dividend income alone, with enough left over for all the extras – the vacation timeshare, the European cruise or the patio extension you’ve waited too long to build. All the while, you’ll be able to grow your nest egg, which acts as extra protection against life’s ugly surprises.